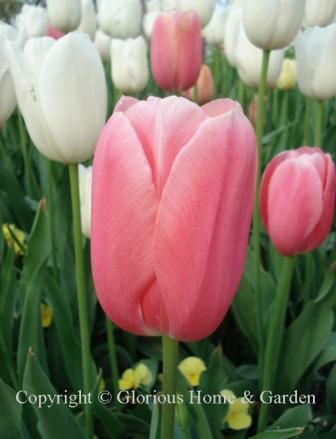 Tulips have been classified into 15 divisions determined by their shapes, growth habits, and bloom times. Single Early, Zones 3-8. Early flowering on short stems, and often scented. Selections include 'Augusta,' pink; 'Beauty Queen,' pale pink; 'Bestseller,' coppery orange flushed with rose; 'Couleur Cardinal,' red flushed with rose on outside; 'Duchesse de Parma,' scarlet edged with yellow; 'Sunny Prince,' yellow; 'White Elegance,' white. Double Early, Zones 3-7. Double Early tulips bloom early in the season like their single cousins but with multiple petals, and are often fragrant. 'Monte Carlo,' clear yellow, is pictured below. 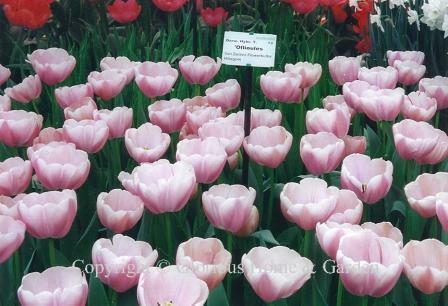 Other cultivars include 'Alice Leclercq,' orange-red with yellow edge; 'Foxtrot,' pink; and 'Mondial,' white. Triumphs, Zones 3-7. 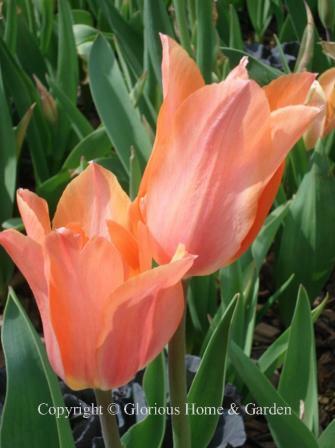 Triumphs were developed from crosses between Early Single and Darwin Hybrid tulips, bloom mid-season, and will often return year after year. 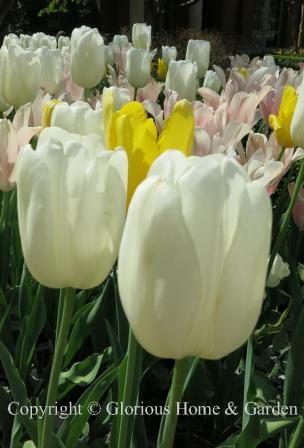 Some notable hybrids are 'Apricot Beauty,' apricot; 'Bastogne,' red; 'Calgary,' white suffused with yellow; 'Gabriella,' pink and cream; 'Happy Generation,' white with red and yellow blotch in center, is show below (the leaves are also edged in white); 'Negrita,' purple. Darwin Hybrids, Zones 3-7. 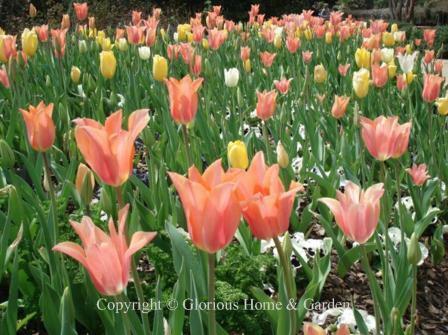 Darwin Hybrids have large flowers on sturdy stems and bloom at the height of the tulip season in late April to May. 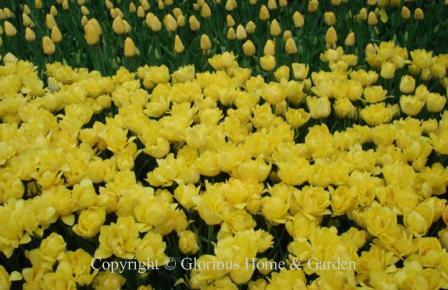 There are many outstanding cultivars including 'Akebono,' yellow; 'Apeldoorn' (shown below-the deeper red one); 'Gudoschnik' yellow streaked with rose-red giving an overall salmon-ish look (interesting in that each flower is slightly different--some may be more yellow, some more red); 'Holland's Glory,' red; 'Ollioules' rose and ivory (shown below at Keukenhof); 'Salmon Impression,' salmon-apricot. Single Late, Zones 3-8. These tall, late-blooming tulips are the aristocrats of the spring garden. They have the classic, elegant goblet shape that one associates with tulips. Many favorites are here including 'Avignon,' red; 'Maureen,' pure white; 'Menton,' pink; 'Mrs. John T. Scheepers ,' yellow; 'Perestroyka,' orange-raspberry; 'Queen of Night,' deep purple; 'Renown,' deep pink; and 'Violet Beauty,' violet-purple. Lily Flowered, Zones 3-7. 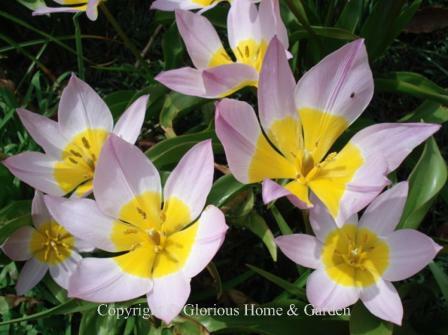 These graceful tulips have outward flaring petals resembling the shape of a lily. Some cultivars to try include 'Ballade,' pink and white; 'Ballerina,' orange; 'Green Star,' green and white; 'Marilyn,' red and white; 'Red Shine,' red, and 'West Point,' yellow. Fringed, Zones 3-7. 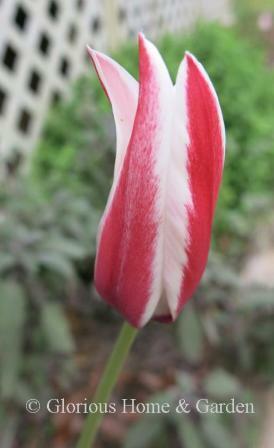 Fringed, sometimes called Crispa, tulips have finely cut edges that look like they were tipped with frost, or dipped in salt on the edge of a margarita glass. 'Cummins' lavender-blue with contrasting white fringe is one of the most distinctive; 'Daytona' is pure white; 'Fringed Elegance' soft yellow with a touch of red is shown below; 'Max Durand,' is purple; and 'Sunset Miami,' is magenta-pink edged with golden fringe. Viridiflora, Zones 3-7. Viridifloras are available in many colors, but their common characteristic is some green in their petals. Some nice ones are 'Golden Artist,' yellow with red and green; 'Greenland,' pink and green; 'Pimpernel' purple-red with green; 'Spring Green,' white and green; 'Flaming Spring Green, white, green and red. Rembrandt Tulips. These are the famous tulips that were the heart of the tulip craze of the 1600's and were depicted in Dutch still-lifes by artists of the day. Rembrandt tulips are characterized by their streaked, broken color patterns which are actually a mutation caused by a mosaic virus. While Dutch hybridizers have developed lots of tulips with variegated color patterns in other divisions through breeding, true Rembrandt tulips are actually hard to come by today because the virus that causes the feathered patterns also makes for weak plants, and so they are not cultivated. Some modern hybrids with a Rembrandt look include 'Grand Perfection,' cream w/burgundy red markings, 'Prinses Irene,' orange w/purple flames, 'Rembrandt's Favorite,' a purple and white bi-color--all Triumphs; 'Burning Heart,' white w/red flames, and 'Olympic Flame,' yellow with red flames--both Darwin Hybrids; 'Flaming Spring Green,' a mutation of 'Spring Green' with white, red and green--a Viridiflora; and 'World Expression,' a red and yellow Single Late. Check out www.oldhousegardens.com if you are interested in some genuine antiques. 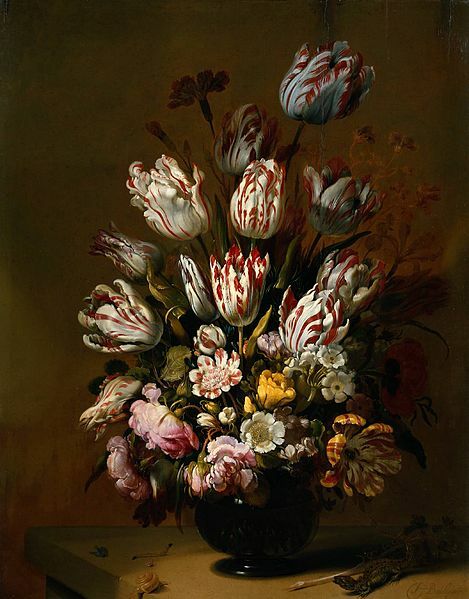 This still life by Hans Bollongier, 1639, from the Rijksmuseum, Amsterdam, depicts the streaked patterning in tulips that caused such a high demand for the bulbs in the 17th c.
Parrot, Zones 4-7. 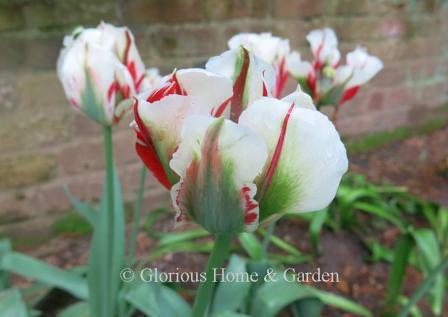 As if tulips in general weren't eye-catching enough, the parrots are the true peacocks of the tulip world. Large, flamboyant flowers often have twisting or curled petals with deeply ruffled or fringed edges , and usually include two colors--often some green as well. They are fun to grow and great for arrangements, but are best treated as annuals as they do not reliably return year-after-year in the garden. Some favorite ones include 'Black Parrot,' a deep purple; 'Estella Rijnveld,' red and white with a bit of green; 'Flaming Parrot,' yellow and red; 'Rococo,' red with purple and green; and 'Weber's Parrot,' pink and cream. Double Late, Zones 3-7. 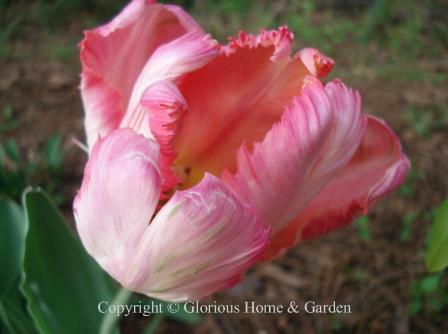 Also called peony tulips, the double lates are large, full, delectable flowers wonderful to grow for arrangements. 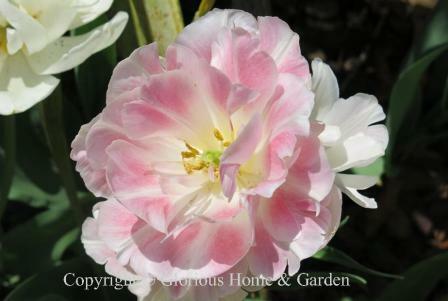 A huge favorite, 'Angelique,' rose and cream, is shown below. Others include 'Black Hero,' deep maroon-purple; 'Carnival de Nice,' white with red streaks; 'Double Maureen', white; 'Dream Touch,' deep pink edged w/white; 'Pink Star,' pink; 'Sensual Touch,' orange and fringed; and 'Yellow Baby,' yellow. Kaufmanniana, Zones 3-8. Also called water-lily tulips for their wide-opening flowers, Kaufmanniana hybrids are shorter (about 8-10") and are better candidates for naturalizing than some of their taller cousins. They often have interesting mottled or striped foliage to add to their charm. Varieties include. 'Fashion' (rose w/purple); 'Giuseppe Verdi' (yellow w/red); 'Ladykiller' (red edged white); Shakespeare'' (red and salmon); 'Stresa' (red and yellow). Fosteriana, Zone 3-8. 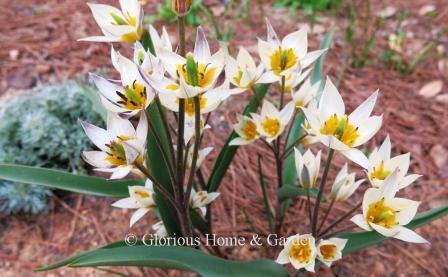 Fosterianas are also called Emperor tulips. 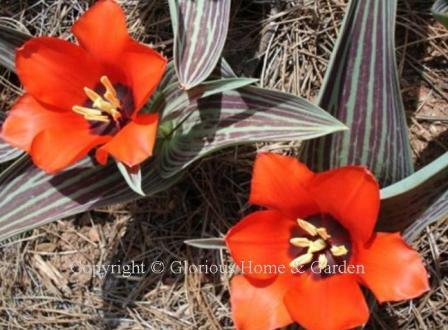 They are characterized by large blooms, tall stems and mid-spring flowering. Some choices include 'Albert Heijn,' pink; 'Flaming Purissima,' ivory and rose; 'Madame Lefeber,' red; 'Red Emperor,' red; 'White Emperor,' white; and 'Yellow Purissima,' yellow. Greigii, Zones 3-7. 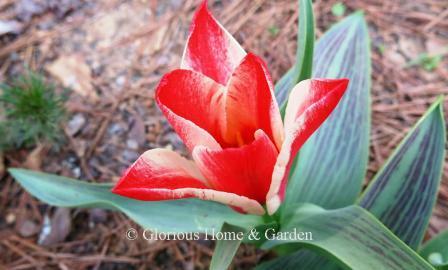 Greigii tulips are well-known for their striped or mottled foliage. 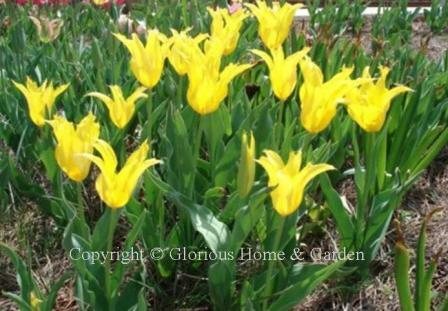 Low-growing, they are perfect for groups of bright color near the front of the border. Varieties include 'Red Riding Hood, red; ''Kiev,' red with yellow edges; 'Oratorio,' rose; Pinocchio,' red and white; and 'Tottori,' pink. Other Species. These are the wild tulips and their hybrids not included in the other categories. 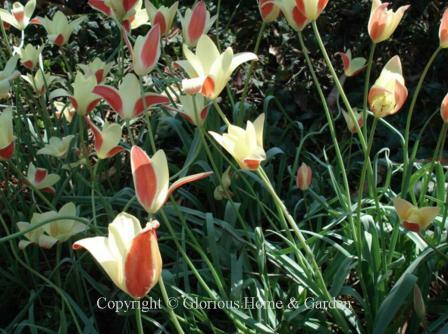 I have been adding a few more species tulips to my garden each year since they can perennialize and last longer than most of the larger hybrids. They all prefer full sun and good drainage. Place them where their cheerful colors can be appreciated as they welcome spring such as at the front of borders, or along a path. T. clusiana, Zones 3-9. 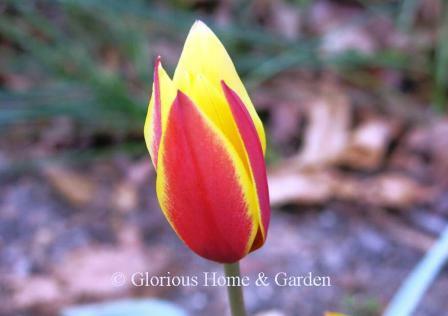 Also called Lady Tulip, this is the sort you would expect to find in a monastery's cloister or medieval herb garden. 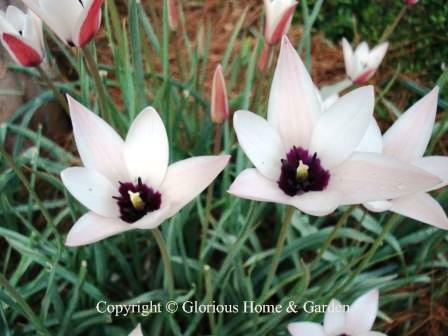 Charming, dainty and graceful, the Lady Tulip has white petals with the outer 3 (tepals) flushed with pink. Closed they look like peppermint sticks. A fully opened flower reveals a white interior with a deep purple blotch in the center. Good for cottage gardens and the perennial border . 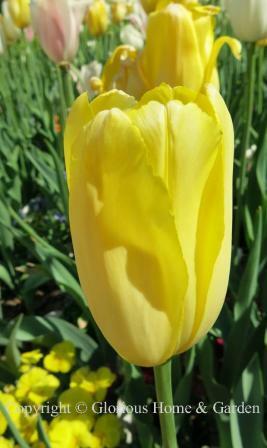 'Lady Jane' is a soft rose pink with white interior and yellow blotch in the center; 'Tinka' is rose with a creamier interior; T. clusiana var chrysantha, (below) the candlestick tulip, has red petals edged with yellow and yellow interiors. T. humilis 'Alba Coerulea Oculata,' Zones 4-8. 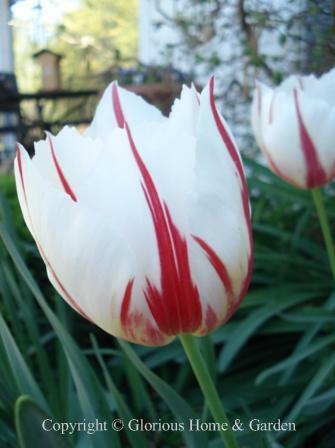 This one has red outer petals that open to white with a deep blue center. T. saxitilis, Zones 5-10. Blooming in mid-spring, these low-growers (about 6") open distinctive pinkish-lilac petals wide to reveal bright yellow centers. T. turkestanica, Zones 3-8. 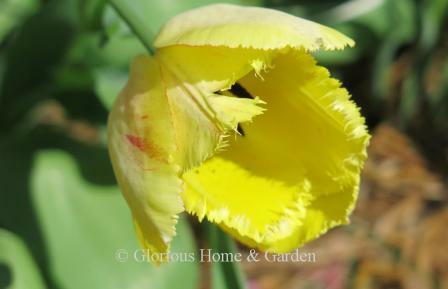 A native of Turkey, for which it is named, T. turkestanica is a charming multi-flowered tulip with white petals and yellow-orange centers, with often purple-tipped anthers.